Ok, so I’ve never made a sunburst card. Shocking I know! I’ve said it before that I’m kind of a lazy cardmaker, so learning new techniques gets put off until challenges like this – then I have to try and quickly learn them. I decided to stick with my shabby kind of style and added a panel of sunburst with my usual flowers/leafage combo. Come and join in with our fun Sunburst challenge. I can’t wait to see what you create. Head over to the challenge and check out the gorgeous inspiration from the design team. I had to laugh at your comment about learning new techniques as and when you need to. You have nailed this one Narelle. I love your lopsided, shabby take on the sunburst technique and the colours you chose too! I wouldn’t call you a lazy cardmaker, far from it. I like how you have shown that you can incorporate this challenge not only in a different way but also in different colours from the expected. Beautiful. Love the sunburst panel you created. 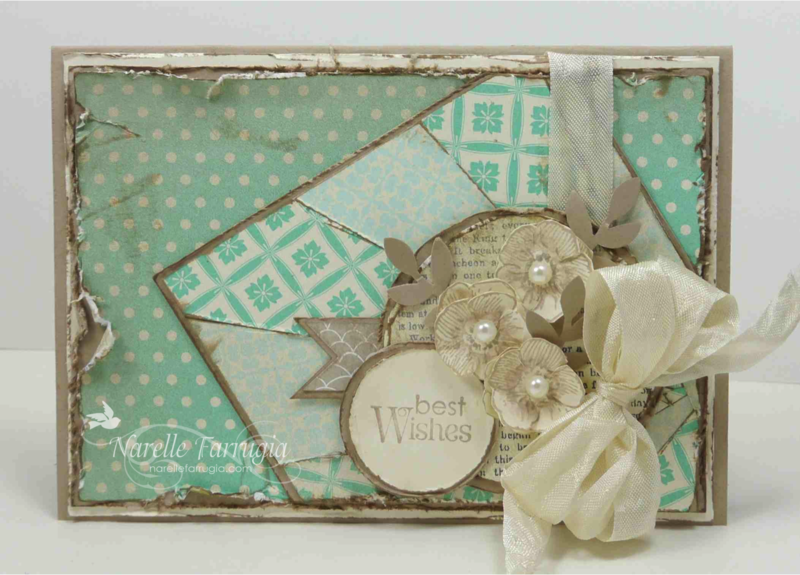 You really rocked this challenge with your beautiful, shabby chic style. Love it.